LAS VEGAS- Rick Hord won the annual Pro Mod Shootout exhibition race. He earned top qualifier honors with ease. Winning the class finals of the 14th running of the Nitrous Outlet Street Car Super Nationals Presented by FuelTech seemed a foregone conclusion. However, things at The Strip at Las Vegas Motor Speedway rarely go as forecasted this time of year as Ed Thornton, who qualified second in Precision Turbo Pro Mod, took the victory in a solo pass. Hord, who had a bye run in the semifinals, had suffered engine damage and was only able to stage and break the starting line beams to advance to the finals. The Florida native was unable to answer the call to the finals, effectively handing the victory to Thornton, who provided the fans with a show by rocketing to the win with a lap of 5.543 seconds at 274.61 mph. Hord was the polesitter thanks to an official pass of 5.587 seconds despite laying down a 5.52 during his Pro Mod Shootout run. Thornton had the fastest car on the property by a lot, his qualifying speed a 270 mph pass. "We put a tuneup for (Hord) in it, so that's what he would've got," Thornton said after the race in the Winners Circle. "The whole weekend, we've been trying to figure out who to get there and we got there!" Thornton earns his first-ever SCSN victory after more than ten attempts. The much-hyped 4-Wide With A Twist proved to live up to expectations, providing some of the best racing in the history of the event. Whether it was the ability to move quickly between radial tire and slick tire racing thanks to the extra two lanes, or the history-making 4-Wide $10K to win grudge match, it created a new level for the legendary drag race. In MagnaFuel Outlaw 10.5 action, Mike Keenan continued the trend of No. 2 beating No. 1 when he treed Mark Woodruff with a reaction time of .059 seconds versus Woodruff's .117 seconds. The quicker launch allowed Keenan a holeshot victory of 3.945 seconds at 201.10 mph over Woodruff's pass of 3.909 seconds at 205.88 mph. In fact, of the finalists who were also top qualifiers, only Dan Dagata of the Ross Pistons 235 Limited class earned a win, beating Mike Silva with a run of 5.268 seconds at 134.40 mph. No-Time racing was given a grand stage at SCSN 14, with Big- and Small-Tire shootouts as well as the Ultimate 8 Series with a $20,000 check to the winner. In Flying A Motorsports Small Tire, Frank Yee earned the win with John De Jonge--one of a regular contingent of Canadian racers--taking the victory in Hughes Perf Big Tire. Daniel Pharris took the twenty large from Roger Holder in an incredible finale to the Ultimate 8. "That's why we race," said SCSN Promoter Mel Roth. "If you looked at the qual sheets for all these races, you'd probably say the top qualifiers had the advantage for a lot of reasons. When only one top qualifier can leave here with a trophy, that says anyone has a shot to win. We make this race a challenge for a reason. It doesn't matter how much money you have in your car when that fifty-cent piece lets go in the semis. "I'm extremely proud of all our racers, our staff, the incredible work the track crew provided, and what I think was the best Sunday of racing we've had here in a really long time. Can we go ahead and get SCSN 15 started now?" 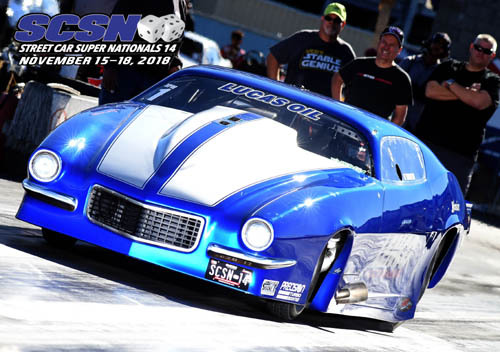 Make your plans TODAY for Street Car Super Nationals 15 at The Strip at Las Vegas Motor Speedway Nov. 20-24, 2019!